Pancreatic cancer treatment differs between each patient and is generally based on the stage of cancer. Once diagnosis is confirmed, treatment plans are based on several factors, such as the stage and location of the cancer, the patient’s age and general health state. Advanced stages of pancreatic cancer cannot always be treated with the aim of completely curing the cancer. However, combinations of treatments are used to help relieve symptoms, prevent the tumour spreading, and maintaining a quality of life. There are several treatment options for pancreatic cancer with the most common being surgery, endoscopic treatment, chemotherapy or radiation therapy. Patients may have just one of these treatments, or a combination. The information presented is aimed at providing information to patients that they can use when discussing treatment options with their specialist. – The body and tail of the pancreas and usually the spleen are removed. – This involves total removal of the pancreas, part of the stomach, part of the small intestine, the common bile duct, the gallbladder, and nearby lymph nodes. Palliative surgery can be performed which help to significantly relieve symptoms and improve the quality of life. 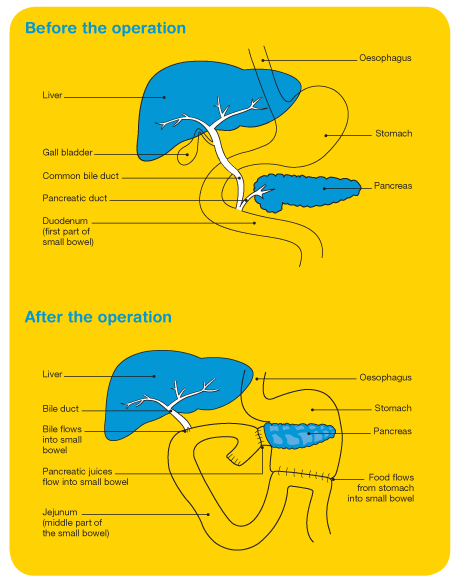 – This surgery is performed to re-route the bile flow from the liver to the intestines around the obstructing area. This involves cutting the bile duct above the obstruction and sewing it to the small intestine to create to create this bypass. – If the tumour blocks the bile duct so that bile is unable to drain away normally into the digestive system, a stent (a small tube) may be inserted to drain bile that has built up in the area. It is most often done during an endoscopy. The stent can be placed through the skin with local anaesthetic. The doctor guides the stent into position using x-ray. – If the tumour blocks the flow of food from the stomach, the stomach may be sewn directly to the small intestine so that a patient can continue to eat normally. Chemotherapy is the treatment of a cancer by anti-cancer drugs. It aims to either kill cancer cells or stop the cell from dividing. Chemotherapy may be used as an added treatment after surgery for pancreatic cancer, often in combination with radiotherapy. In cases where a patient has advanced cancer, chemotherapy may also be used where surgery and radiotherapy is not possible. This treatment aims to relieve the symptoms, particularly the pain, rather than cure the cancer. 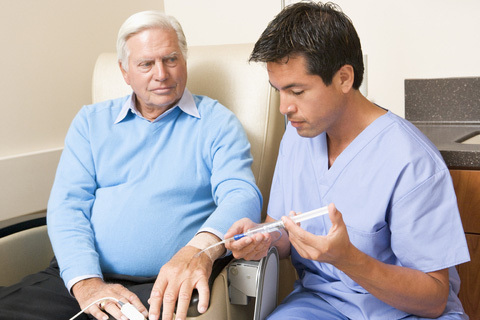 Chemotherapy can be administered orally or intravenously. The chemotherapy enters the blood stream and can, therefore, reach areas of the body where the cancer may have spread. Chemotherapy treatment is usually given over several hours or a few days, and followed by a rest period of two to three weeks. The type of chemotherapy drugs and duration of treatment should be discussed with your treating specialist. Chemotherapy can cause different reactions in different people, but the important thing to realise is that they are short-term and will gradually subside once treatment has ceased. 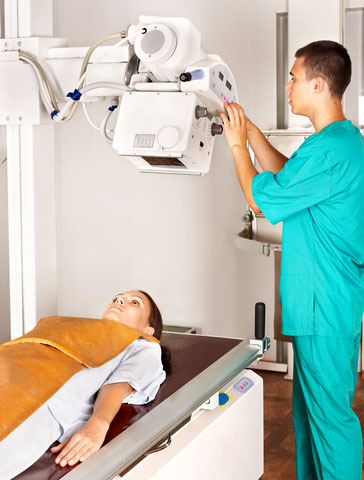 Radiation therapy treats cancer by using high-energy x-rays, which destroy or shrink cancer cells at the site of the tumour, while doing as little harm as possible to normal cells. Radiation therapy may be used to treat cancer of the pancreas that has not spread but cannot be removed by surgery. It can be administrated in combination with chemotherapy or alone, usually after surgery, to reduce the tumour size and keep it under control for as long as possible. It may also be used to relieve symptoms, particularly pain, rather than to cure the cancer. The most common form of radiotherapy used to treat pancreatic cancer is external beam radiation therapy. External beam radiation therapy uses an external device (linear accelerator) to generate high-energy rays that are focused on the targeted area. Radiotherapy for pancreatic cancer may cause some side effects depending on how much treatment is being given. Some of the known side effects include tiredness, a reddening or burning sensation of the skin, nausea, vomiting and diarrhoea. 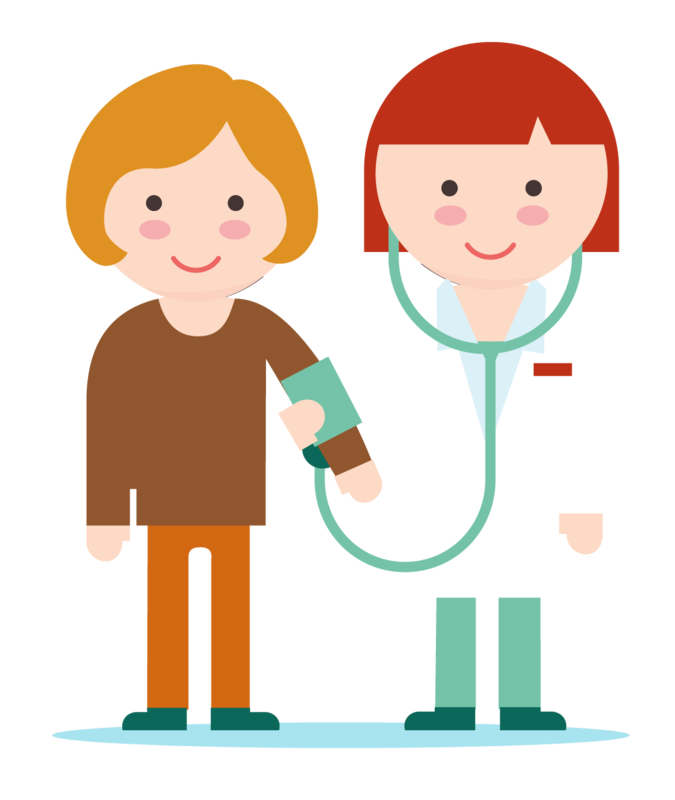 Side effects can be managed to some extent, so it is useful to speak with your doctor about any concerns.